Home About Us Company News Quality Supervision to enhance the quality competitiveness of SBM. Quality Supervision to enhance the quality competitiveness of SBM. As an important part of HPC220 hydraulic cone crusher made by ShiBang Machinery Co. Ltd(hereafter referred to as SBM), quality supervision is also a significant content of quality management. At present, the quality supervisors of SBM have taken part in the whole monitor of HPC220 hydraulic cone crusher production, including machine processing,assembly, welding and other aspects.They summarize and feedback the problems timely in order to meet the customers' demands faster and better. When referring to the significance of the job, engineer Tian---our quality supervisor has his own attitude: creating perfect quality is always our unremitting pursuit, and the arrangement of the quality supervisor is aimed at prompting the process. "To tell the truth, the pressure is really great when you are in this position. Although I have engaged in related work for many years, the supervisor is required to control the whole process, and to be good at discovering problems so as to summarize and improve. So constant learning is a must." Reportedly, in addition to the selection by the internal layers, the quality supervisors have got systematic training about related law,producing procedure, and related rules. What's more, our company specially appointed Engineer Guo,the senior technician, to take guidance of the supervision process. In addition, our quality supervisors will summarize and analyse the problems found at the producing scene , and then carry out special training for the counterpart staff in related area. As for the achievements of the quality supervisors , our company will conduct regular assessment according to the production and the feedback of the customers. 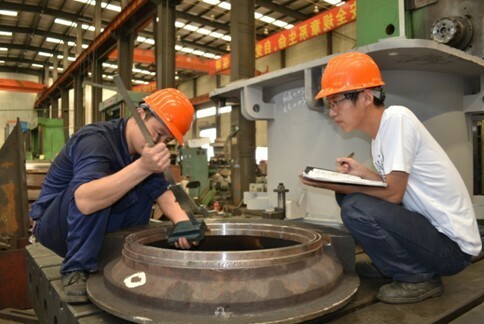 During the interview, Engineer Qiang,one of quality supervisor, has shown us all the record of cone crusher production supervision, and only for the assembly process, there are more than 20 process supervision records including cleaning, installation of sealing ring, spindle assembly, installed oil seals and so on.According to the introduction,each test data will be collected and sorted, and then recorded in the corresponding database of HPC220 hydraulic cone crusher.